Millie the greyhound was born in a breeding kennel in Campbelltown. She would have been sold into a life of racing, but she lost one of her paws when she was a six week old puppy. It would turn out to be a blessing in disguise. She was adopted by Nora Anderson-Dieppe, who took pity on the three-and-a-half legged puppy. Millie now walks, a little unsteadily, on a prosthetic leg. “She doesn’t fully weight-bear but she uses it when she runs and swims. But she’s just a very happy girl. Nothing fazes her,” Nora says. But Millie’s brother, Jack, was not so fortunate. After performing poorly on a NSW trial racetrack, he was exported to Macau, China, where he now races alongside over 700 other greyhounds in the Canidrome racetrack, the only legal greyhound racetrack in Asia. Jack has placed 5th and 6th in his last 6 races at the Canidrome, and unless his track record improves, it is likely that he will be euthanised. Jack is one of the thousands of Australian greyhounds sent to the Canidrome until late 2015. 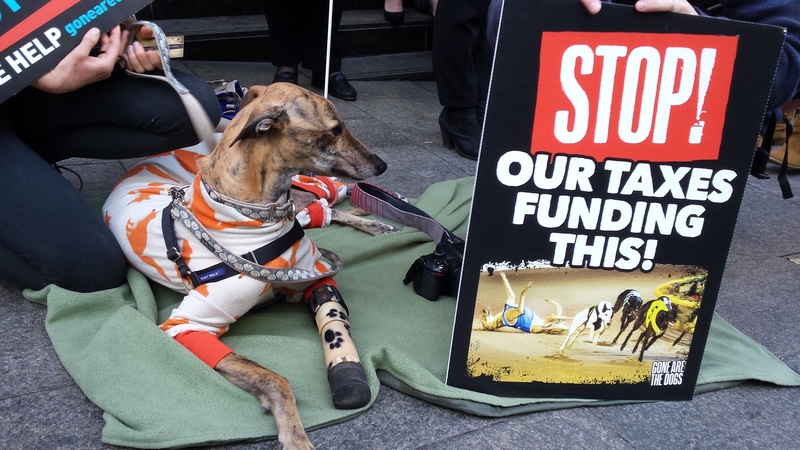 Australia supplied around 400 greyhounds a year to the stadium, until exports halted under pressure from animal rights groups, such as Animals Australia and Animal Liberation. But that has made little difference to the Candrome, which now imports its greyhounds from Ireland instead. 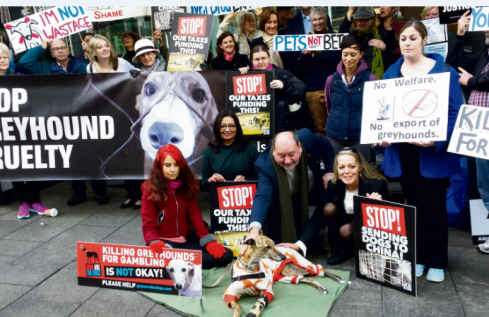 At a rally outside the Irish Consulate in Sydney last week June 2, Nora met with animal activists from Animal Liberation NSW, the Animal Justice Party, and the Greens NSW, to demand a ban on greyhound exports from Australia and Ireland. Mark Pearson MLC, head of the Animal Justice Party, said it was “unacceptable” to export greyhounds to Macau, given its lax animal protection laws. Video footage gathered by Animals Australia and broadcast by the ABC revealed that the greyhounds were kept in small cells, and slow or injured racers were routinely euthanised. Following the media coverage, the Qantas and Cathay Pacific airlines began refusing to transport greyhounds from Australia. But Mehreen Faruqi said that there was no guarantee that the exports wouldn’t continue. Lynda Stoner, CEO of Animal Liberation NSW, said she was optimistic that the Canidrome would close down, and the Jack would be brought home. If the Canidrome does close down and Jack is reunited with his sister, it will be the first time the two dogs have met in nearly 3 years. But time is not on Jack’s side. If he is injured on the racetrack, or if he continues to perform poorly, then he may be put down any day now. Nora is campaigning to #bringjackhome. She says she wants all of the Canidrome greyhounds to be adopted out, before it is too late.